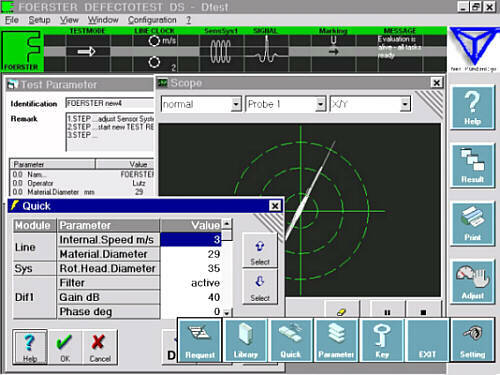 Since more than fifty years FOERSTER is manufacturing equipment for nondestructive testing of metallic semi finished products like tube, wire and bars with electromagnetic methods, including eddy current and flux leakage. Just now FOERSTER is introducing a new fully digital equipment generation which offers enhanced documentation facilities as is indispensable for compliance with ISO 9000 ff requirements and within the framework of product liability. As well this new system, based on Windows NT, allows convenient operation and uncompromising network integration. In the following the new eddy current system CIRCOGRAPH DS and new rotating heads are presented. 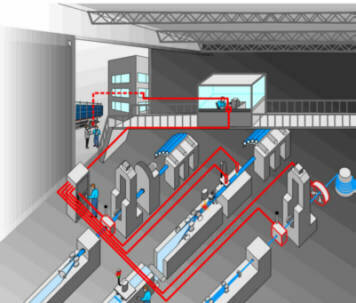 The surface of semi-finished products is scanned with scanning probes. This allows maximum flaw resolution for surface-exposed, lengthwise flaws on bright material. 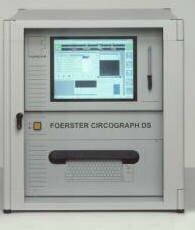 FOERSTER offers various configuration levels, ranging from the single-channel, low-cost compact instrument through to the multi-channel system which may also integrate a DEFECTOMAT channel. Rotating heads for use on round stock cover the diameter range from 2 to 130 mm. Typical fields of application include wire drawing machines, copper tube winders or finishing sections. Individual arrays with rotating disks scan flat and profile material, e.g. when testing rails and shotblasted rectangular billets. Four rotating heads are used for eddy-current testing with the CIRCOGRAPH for the diameter range 2 to 130 mm. Special solutions with stationary sensors and rotating test material can be implemented for larger diameters. Maximum test speeds of up to 8 m/s , assuming scanning without omission, are possible, depending on the version of the rotating head, sensor complement and rotational speed. Small, compact rotating head for diameters 2 - 20 mm, fitted with 2 test heads of pin design. Together with the motor control MOC E (9,000 rpm), it is possible to achieve a maximum test speed of 1.5 m/s with scanning without omission, with 2 test heads, each with 5 mm track width. A maximum speed of 3 m/s can be implemented with the motor control MOC EV (18,000 rpm). The Ro 20 can be operated with the CIRCOGRAPH CP (single-channel) or with the CIRCOGRAPH DS (2-channel). The Ro 35 is designed for the diameter range 2 - 35 mm and is available optionally with 4 test heads of pin design (P) or lever design (L). Together with the motor control MOC E (4,500 rpm), it is possible to achieve a maximum test speed of 1.5 m/s, assuming scanning without omission, with 4 test heads, each with a track width of 5 mm. With the motor control MOC S or SB (9,000 rpm), it is possible to achieve a maximum test speed of 3 m/s. On the Ro 35 L, only 2 levers can be used in the case of diameters less than 5 mm, and the maximum test speed is then reduced to half. The field of application of the Ro 35 P relates to the bright steel sector with polished surfaces for testing bars with good end condition. The field of application of the Ro 35 L relates more to a drawing line where the condition of the ends may cause difficulties when threading up and exiting. The levers are able to deflect if they come into contact with the material. Both rotating heads are optionally equipped by roller guides in front and at the rear side of the rotating head. This guiding system is helpful if the production line does not provide guiding elements just before and after the rotating head to guarantee central feeding of the test material and to suppress vibrations. The new developed design of the rotating heads allow a very comfortable diameter setting from the lateral side. So it is not necessary to shift the rotating head out of the line by a shifting table when the material diameter is only changed by a few tenth of millimeter. Of course if the material diameter is changing by more than a millimeter it is necessary to change the nozzles and this makes it necessary to shift the rotating head out of the line. 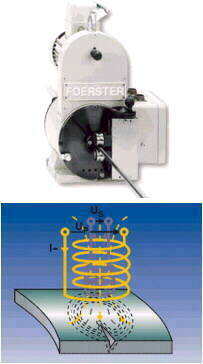 The top model for eddy-current testing with rotating probes. The newly introduced instrument system, based on Windows NT, allows convenient operation and uncompromising network integration. 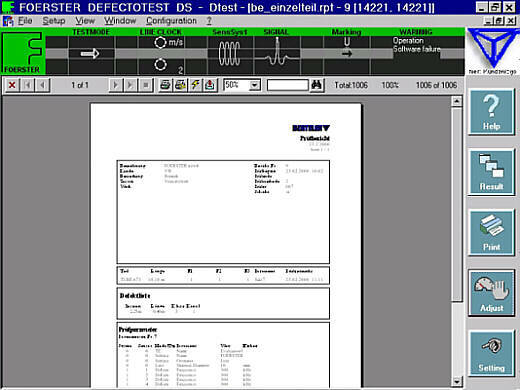 FOERSTERnet allows access to the test instrument from any number of computer stations simultaneously, even if there are different interests, e.g. current test status, test result of the last job tested or a lot from last month for reasons relating to investigations. The system uses the networking capability and multitasking power and performance of Windows NT. Modern touch screen technology and application wizards simplify dialogue and prompt the operator reliably to ensure the right instrument settings. Documented quality according to ISO 9000 through user specific automatic recording is a further important feature of this new system.